Apparently drinking also affects the ability to s awake during State of the Union speeches by POTUS. She has told key Democratic members of the Senate about her medical condition, including ranking Democratic member of the Judiciary Committee Dianne Feinstein. I would like her off the bench, but I don't wish her that kind of trouble. It makes sense. She's giving the Democrats as much time to prepare to oppose anybody Trump is going to nominate. I hate cancer. I'm sorry she's battling it. Barring something crazy, Trump should easily win re-election in 2020. As long as the House Dems follow through with their plan to launch investigations that make the Kavanaugh hearings look calm and professional by comparison, the Republicans will retake the house and further extend their senate majority. So Trump should get at least 2 more SC picks before he is done. I am surprised the report said melanoma recurrence (which is bad) and not pancreatic (which is very bad). I am really surprised that she is alive now with a history of pancreatic cancer. Everyone was so sure that HRC was going to win that RBG apparently felt that she could continue on with the court and retire and let HRC appoint a new justice. One really has to say that McConnell took a tremendous role in all of this by first not allowing Garland to be voted on as had HRC won we would have had a real lefty nominated to the court. 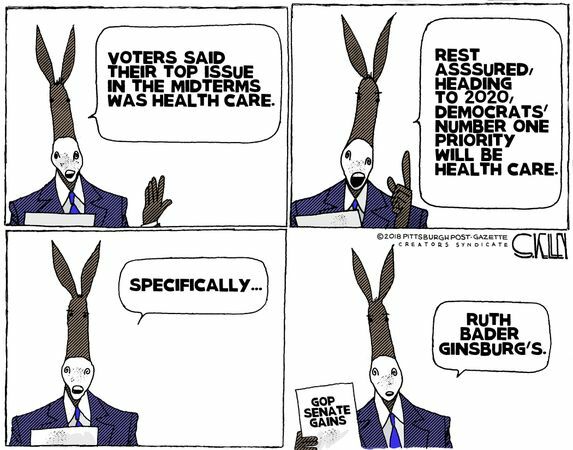 I predict RBG will be off the court during Trump's term, another conservative will be appointed and this and the other federal judges put in by Trump will be his legacy. And when the Dems retake in 2020 or 2024 and try to pack the senate with 15 justices? What happens then? You may be right so we must keep at least one side republican to prevent legislation allowing it.